A dramatic pair, Gregory (Noel Rubio) and his mother Bobbie (River MacLeod) face off in an energetic argument in "A World of His Own, a Twilight Zone Parody." 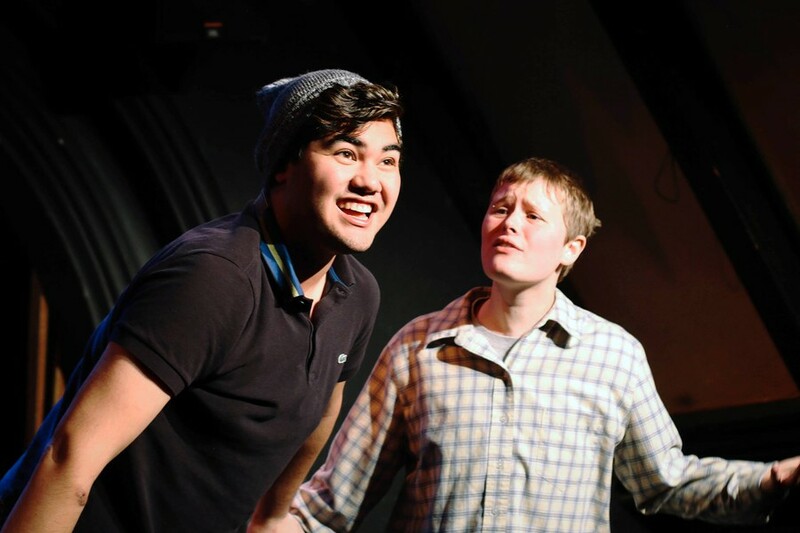 University Theater (UT) closed fifth week with A Weekend of Workshops, an ambitious endeavor highlighting students’ short pieces, rehearsed over the course of just five weeks. This winter brought three pieces to the stage of the FXK Theater in the Reynolds Club. Drawing on a variety of classic works, this production took delight in playing with the audience’s relationship to the scenes before them, with surprising results. The first of the three acts was Coriander Mayer’s “Pericles, but Marxist.” To welcome us into this Shakespearean world, Tess Gundlah delivered a charming iambic-pentameter version of the FXK’s fire safety speech (any visitor to this theater will know about its remarkably hazardous design and UT’s creative efforts to inform its audiences of the escape routes). Gundlah’s narrative then segued into “Pericles,” a heroic tale of love, lost family, and reunion, all told while standing before what appeared to be a hand-painted portrait of Karl Marx. 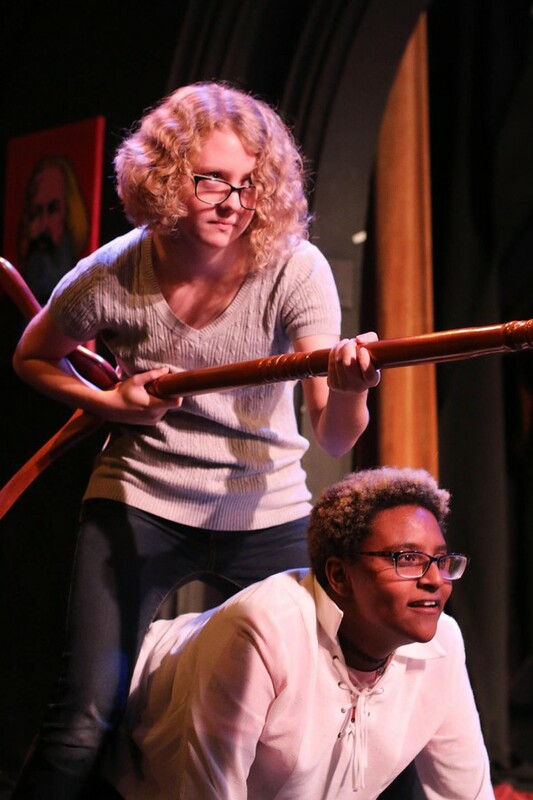 Tess Gundlah and Mariam Desta gear up for a joust in "Pericles, but Marxist." Marx oversees the scene from his proud position on the wall. I must admit that beyond Karl’s omnipresence on the wall, I thoroughly lost the Marxist vein of the production. The frenzied combination of a minimal cast, disorderly college-themed props and costumes, and simply trying to get through an entire Shakespearean plot in less than half an hour fueled this production with a certain chaotic creativity. Part of me thought it should have found a brand and stuck to it. Nevertheless, the cast’s energy and hilarity made this theatrical collage a delight to watch. The next act was an excerpt from Anton Chekhov’s The Cherry Orchard, directed by Rami Kablawi. The play—Chekhov’s last—is known for its duality, and Kablawi explored this aspect by envisioning a single scene as both a comedy and a tragedy. Lubov (played by first-year Gio Hooton) revisits her childhood nursery and confronts the reality of her personal debt, which she considers paying off by selling her cherry orchard. The audience is first thrown into the scene’s humorous interpretation before the stage is reset for the more emotional take. Kablawi’s interpretation raised varied reactions in the audience, ranging from confusion to curiosity, an emerging theme among all of the night’s acts. The last workshop was “A World of his Own, A Twilight Zone Parody” under the capable direction of Emma Heras, based on an episode of the same name. The scene centers on a college-aged playwright named Gregory Hayden-Smith (third-year Noel Rubio) who, even while squandering his time on Super Smash Bros. and warm beers, considers his dramatic talents a gift to the world. As he settles in with a charming acquaintance (second-year William McKissock), the pair is disrupted by an unexpected return visit from Hayden-Smith’s mother (first-year River McLeod), who spotted them through the window. Soon Gregory reveals that the characters he writes become flesh and blood if he records their description into his voicemail, and that one of them was sitting in his room with him moments earlier. From there, it becomes increasingly unclear which character was created by whom, leaving the audience with many questions about reality and trickery. The evening’s performance elicited a curiosity that only a show just out of the rehearsal process can. If you’re curious to see more of the ideas students are bringing to campus theater, check out the variety of new works and workshops that UT presents every quarter. Visit http://arts.uchicago.edu/theater-and-performance-studies/performing-groups/university-theater for information on all of this quarter’s shows.